Of the descendants of Vrishni I am Vasudeva, and of the Pandavas I am Arjuna. Of the sages I am Vyasa, and among great thinkers I am Usana. Krishna is the original Supreme Personality of Godhead, and Baladeva is Krishna’s immediate expansion. Both Lord Krishna and Baladeva appeared as sons of Vasudeva, so both of Them may be called Vasudeva. From another point of view, because Krishna never leaves Vrindavana, all the forms of Krishna that appear elsewhere are His expansions. 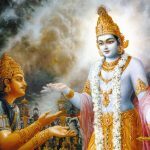 Vasudeva is Krishna’s immediate expansion, so Vasudeva is not different from Krishna. It is to be understood that the Vasudeva referred to in this verse of Bhagavad-gita is Baladeva, or Balarama, because He is the original source of all incarnations and thus He is the sole source of Vasudeva. The immediate expansions of the Lord are called svamsha (personal expansions), and there are also expansions called vibhinnamsha (separated expansions). Amongst the sons of Pandu, Arjuna is famous as Dhananjaya. He is the best of men and therefore represents Krishna. 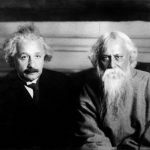 Among the munis, or learned men conversant in Vedic knowledge, Vyasa is the greatest because he explained Vedic knowledge in many different ways for the understanding of the common mass of people in this Age of Kali. And Vyasa is also known as an incarnation of Krishna; therefore Vyasa also represents Krishna. Kavis are those who are capable of thinking thoroughly on any subject matter. Among the kavis, Usana, Sukracarya, was the spiritual master of the demons; he was an extremely intelligent and far-seeing politician. Thus Sukracarya is another representative of the opulence of Krishna. Among the Vrsnis, I am Vasudeva, who is my father. He is my vibhuti. The rule is given as follows: prajnaditvat (Panini 5.4.38). Sometimes the long a can have the same meaning as short a. The long a is used to indicate self-interest. Others would propose that he should have said “Among the Vrsnis, I am myself, the son of Vasudeva.” This however is not agreeable, as it does not mean anything. 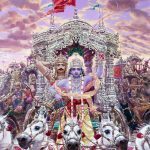 10.37 Here the Supreme Vibhuti (manifestation) is that of being the son of Vasudeva, because no other meaning is possible. 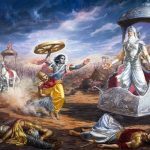 Of sons of Pandu, I am Dhananjaya or Arjuna. Of sages who perceive truth by meditation, I am Vyasa. The seers are those who are wise. Of the Vrishnis or His apparent lineage, Lord Krishna’s vibhuti or divine, transcendental opulence is Vasudeva which means the son of Vasudeva. It would not be acceptable for Lord Krishna to be naming Himself because He is describing His vibhuti and so the only other son of Vasudeva is Balarama who is Lord Krishna’s first and foremost expansion and who expands as all the other incarnations with the exception of Narayana the ruler of all the spiritual planets in the spiritual realm of Vaikuntha who is Lord Krishna’s direct expansion. 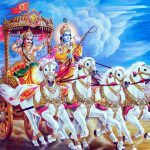 Of holy sages or those who are knowledgeable of all the Vedic scriptures Lord Krishna’s vibhuti is Vyasadeva who divided the one Veda into four, wrote the Puranas and Brahma Sutras and compiled the historical treatise Mahabharata. Of exalted seers or those who are omniscient His vibhuti is Usanah the son of Brgu who is known as Sukracarya the guru of the asuras or those born in demonic lines. Enveloping everything or containing all, abiding in all and the goal of all Lord Krishna is known as Vasu, Being the God of all gods He is known as deva. Thus He is Vasudeva and a vibhuti or divine, transcendental opulence of Lord Krishna. The Moksa Dharma scripture states: Enveloping all creation He illuminates it just like the rays of the sun as the indwelling monitor within all living entities, He is therefore known as Vasudeva. Being especially in all things as the best of them, His vibhuti is Vyasa. The Agniveshya section states: He is Vyasa. Vy means the best. He is above, He is below, He is in the east, He is in the west, He is in the north and He is in the south. Whatever we see or hear in any direction externally or internally in all dimensions is already established by the Supreme Lord. Among the descendants of the Vrishni lineage Lord Krishna’s vibhuti or divine, transcendental opulence is the son of Vasudeva. As Lord Krishna is describing His vibhuti it is not logical that He would be would be referring to Himself. The only other son of Vasudeva is Balarama who is the first expansion of Lord Krishna and the direct source of all other avataras or incarnations including Rama and Vishnu. So Lord Krishna’s vibhuti as the son of Vasudeva is the all powerful Balarama. Lord Krishna declares that among the Pandavas His vibhuti is Arjuna and among self-realised sages His vibhuti is Vedavyasa and among seers or those who are omniscient His vibhuti is Usanah better known as Sukracarya, the preceptor of those born in demoniac lines. 10.37 Vrsninam, of the Vrsnis, [Here Ast. adds yadavanam, of the Yadavas.-Tr.] I am Vasudeva- I who am this person, your friend. Pandavanam, of the Pandavas, (I am) Dhananjaya, you yourself. Api, and; muninam, of the wise, of the thoughtful, of those who know of all things, I am Vyasa. kavinam, of the omniscient (i.e. of the those who know the past, present and future), I am the omniscient Usanas (Sukracarya). vṛṣṇīnām — of the descendants of Vṛṣṇi; vāsudevaḥ — Kṛṣṇa in Dvārakā; asmi — I am; pāṇḍavānām — of the Pāṇḍavas; dhanam-jayaḥ — Arjuna; munīnām — of the sages; api — also; aham — I am; vyāsaḥ — Vyāsa, the compiler of all Vedic literature; kavīnām — of all great thinkers; uśanā — Uśanā; kaviḥ — the thinker.